What began as a way to remotely tutor his young cousin and her classmates in algebra has given former hedge fund analyst Salman Khan ’98, MNG ’98 a new career: virtual teacher. Khan, who studied math and electrical engineering and computer science at MIT, starting posting short videos on YouTube as a way to be more efficient with the math help he was offering from Silicon Valley to his cousin in New Orleans, and they took on a life of their own. A little more than three years later, he’s launched the nonprofit Khan Academy virtual school/YouTube channel and created 1,000+ tutorials on everything from basic arithmetic to college-level calculus and physics as well as biology, chemistry, finance, statistics, probability, economics, SAT and GMAT prep, and more. More than 32,000 people subscribe to the YouTube channel, which boasts millions of views worldwide. A chemistry teacher in Uruguay translated one of his videos, and others have volunteered to translate the lessons into Arabic, Polish, Portuguese, and German. For now, though, Khan is a one-man show, and the short videos, generally eight to 15 minutes long and each focusing on just one concept, take him about thirty minutes to produce and upload. Now that he’s turned his attention full time to the academy, Khan hopes to create some 200 new videos each year, like his recent lectures on Federal Reserve banking generated after he read the Federal Reserve Act following last year’s financial crisis. Check out an interview from NPR’s All Things Considered and learn more about the Khan Academy, which received the 2009 Microsoft Tech Award in Education, in the video below. 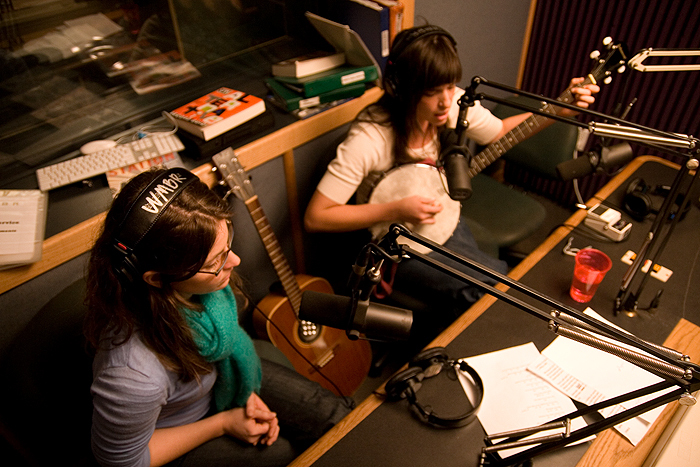 If it has been awhile since you listened to WMBR, MIT’s campus-based broadcast service, this is a suggestion to tune your radio dial to 88.1 FM if you’re near Cambridge, or direct your browser to wmbr.org if you’re anywhere else. The station continues to provide a dazzling array of aural treats, everything from trance/dance to free speech radio news. Today, meet Joan Hathaway, WMBR DJ and longtime host of the Three Ring Circus, a show that airs weekly on Friday afternoons from 4-5:30 pm ET. What kind of show is the Three Ring Circus? JH: Three Ring Circus (3RC) is a multi-genre music program heavy on roots music (Americana, Blues, Country, R&B, Rock and more). I like to say “playing music to make your soul sway, your hips shake, and your heart break.” Kind of your personal music assistant for roots and rock music. In the last year, I’ve been booking guests almost weekly and mostly from Boston’s local roots scenes which is full of amazing talent. 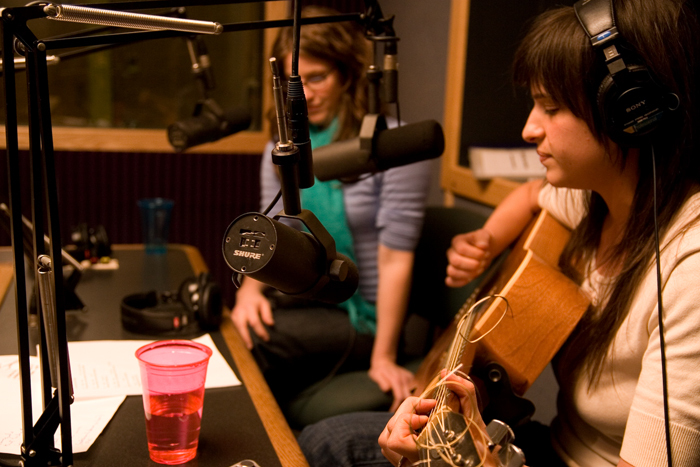 What distinguishes it from other programs on WMBR? JH: WMBR has over 70 programs, most of them music with a handful of public affairs programming. The music shows are heavy on indie rock, punk rock, 60s rock, jazz, with a smattering of R&B, electronica, ambient, and garage shows. We all have some crossover with each other, but 3RC’s focus on roots music and the local roots and rock scene is unique. 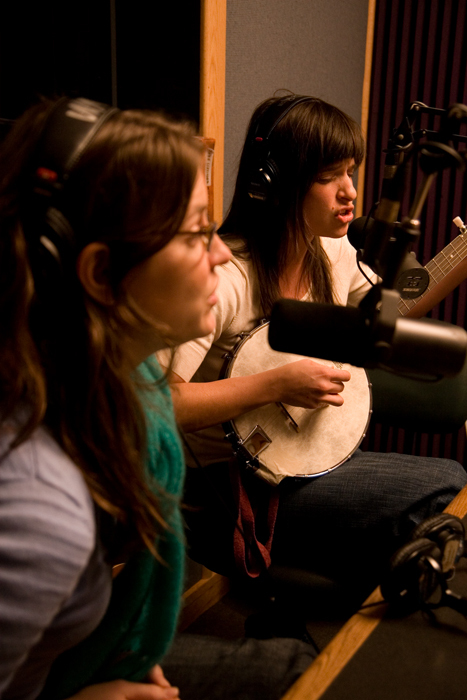 Additionally, live musical performances on 3RC is only surpassed by Pipeline, WMBR’s weekly live local music program. How and when did you get involved with WMBR? JH: 1991. I was a production intern at WBCN. I hit the glass ceiling, so of speak, and was looking for a place that would allow me to be more creative. Then, WBCN DJ and former WMBR DJ, Albert O suggested I get involved with WMBR. My first show was a 1/2 hour weekly news parody show called “Have You Heard the News Lately? (HYHTNL? )” Three Ring Circus came a season later and HYHTNL? was retired in 1994. I worked with some really funny people on that show, but man what a lot of work. JH: I feel a huge sense of pride when local bands get traction outside of Boston. Local bands Sarah Borges & the Broken Singles, Girls Guns & Glory, and Eilen Jewell come to mind. Also, the cross pollination that the local roots community has with each other brings about musical introductions I may have missed in the weekly CD deliveries (there’s so much!). For example, a Reva Williams performance at a Sarah Borges show introduced me to her band Gretel [HEAR RECORDING, SEE PHOTOS BELOW]. Gretel’s appearance on 3RC has me very interested in Melissa Harper’s solo efforts (Melissa is the other singer in Gretel). Of course an appearance on 3RC does not make or break musical careers, but I like to think the program is one of the many links between artist and audience. A link that is unique and a joy for artist, audience, and myself. I’m grateful that MIT continues to support original programming like 3RC as well as all the others. You’ll be hard pressed to find the variety and quality, elsewhere. Learn more about Hathaway’s show, view playlists, download archives, and subscribe to the 3RC email list at wmbr.org/circus. A recording of Gretel’s live studio appearance (mentioned in the interview above) is accessible here. Also, check out a few of the beautiful photos that Hathaway snapped during the performance (below). Which Songs Have the Most Staying Power? This limited-edition, numbered poster, signed by Bernhardt and the artist, Jef Czekaj, will be sold at the Boston shows. Think back to 1984. “What’s Love Got to Do with It” by Tina Turner and “Ghostbusters” by Ray Parker Jr. topped the Billboard charts, joined by the likes of Wham!, Culture Club, and Yes. A banner year, that 1984. But from that point on, which songs have you listened to the most? Not so easy without that handy play count column on iTunes, is it? But WMBR (88.1 FM) DJ Jon Bernhardt ’86 set out to figure out which songs and bands he’s played the most throughout his 25 years on the air—in honor of his anniversary. So he spent 18 months typing all of his playlists into a database, in true MIT fashion (the database, not the year and a half of typing). And what were his results? Tune in Friday, June 26, from 8:00-10:00 a.m. to find out. Bernhardt will host a celebratory Breakfast of Champions radio program and count down the 33 songs he’s played most during his career. You’ll hear many of the top bands that morning. Not familiar with Breakfast of Champions? The radio show is described as a “heaping hot helping of deliciously sweet pop, served with a short stack of pretentiously introspective indie rock and a side of crispy punk hits. All washed down with a unique blend of self-deprecation and joie de vivre, aged 25 years.” Bernhardt has promoted numerous groups through the years that later achieved a modicum of fame and success. Bernhardt back in the ’80s. But for those of you who prefer the live experience, he has also set up a benefit concert at two Boston-area clubs headlined by his most-played bands. UK legend Bevis Frond (the number one act on Bernhardt’s career playlist) will make his only U.S. appearance at TT the Bear’s in Cambridge on Sunday, June 21, along with the Condo F*cks and Sleepyhead. On Saturday, June 27, Versus reunites to play at Church in Boston with Buffalo Tom and Rebecca Gates (The Spinanes). Proceeds will benefit WMBR, and tickets for both shows are on sale now. And, if you’re curious, here’s the fruit of that 18 months of labor. All of Bernhardt’s playlists. One final treat. Watch Bernhardt playing “Video Killed the Radio Star” on his theremin, an instrument played without touching it. Nationalize the U.S. banking system? When: Monday, February 2nd at noon E.S.T. After the first $350 billion of the 2008 Troubled Asset Relief Program was distributed, American taxpayers became the *biggest shareholders* in Citigroup and Bank of America. The second round of TARP funding has gone out and, as NPR notes, the banks are still in hot water. What do you think? Nationalize the banks now—or never? Tune in to the live chat, or if you have an opinion or a question for the panel, you can leave a comment on the NPR page. Read some of the recent comments. A couple mornings ago I woke up to the voice of Huang Yasheng, an MIT Sloan professor who was being interviewed on NPR’s “Morning Edition.” The segment was about how Shanghai’s glittering skyline may be masking serious economic troubles, among them, a deepening real estate slump. One person interviewed said that problems in the property market were just a regular dip, but the Sloan prof said that the rise of sky scrapers and housing vacancies were much more ominous–they exposed weaknesses in the interventionist, top-down style of Chinese capitalism. Have you been to Shanghai? What’s your take? Listen to the NPR broadcast.